In need of a beach getaway? Aquaholic is the home for you! This stunning home is a newly built single-family attached home near Sombrero Beach. This home offers over 1,700 sq ft of spacious living space and has 4 bedrooms and 3 full bathrooms. Prepare your family's meals in your fully equipped luxury kitchen. This chef style kitchen features granite countertops and upgraded Bosch appliances. Aquaholic provides all the comforts of home and much more! There is one bedroom and one bathroom located on the first level for convenience. The remainder of the bedrooms are located on the second floor. Indulge in the oversized master bedroom which is complete with an amazing en suite master bath. 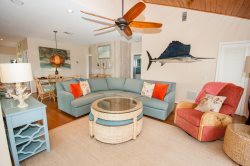 This home sets the stage for the perfect relaxing beach vacation. A private pool and shaded sitting area with a TV mean you can relax and enjoy the beautiful outdoors. Coming to the Florida Keys to fish? Aquaholic makes is a breeze with a 30-foot dock featuring water, electric and fish cleaning station available! fishing spot. Bring your catch back to the home and cook it on the gas grill for fresh-caught dinner! When it's time to go to the beach, Sombrero Beach is just a 15-minute walk from your home. Sombrero Beach is an ideal spot for diving and fishing, with abundant underwater life. Sombrero beach has been ranked as one of the best beaches in the Florida Keys. Sombrero beach is the perfect place to lose track of time with its array of amenities including picnic pavilions, volleyball courts, restrooms, and showers. Marathon is located an hour from Key West and Key Largo. This location is close enough to make the Keys accessible, but far enough to offer some privacy from the tourist scene. Marathon is also home to the only turtle hospital in the United States, as well as an interactive aquarium experience known as Aquarium Encounters.